We’re going to walk the line between hot and not for this first one because there really is no right answer. Many people give a small shout out to those who retweet or favourite a post from your organization. It’s definitely a nice touch, but it’s not 100 per cent necessary. While it’s not improper etiquette to just let these interactions be, it doesn’t take a whole lot of extra effort to write, “Thank you for retweeting us! Glad you like the article/tweet/question. Let us know if you have any other feedback,” or something like that. Who knows, it could even start a nice conversation that might lead to a very happy member, donor, sponsor or volunteer! Social media is a fickle beast. Some platforms, like Twitter and Instagram, want you to pay attention to them every single day. Others, like Facebook, are okay with having your attention every other day. While it’s definitely important to check Facebook several times a day to monitor discussions and track statistics, it isn’t at all necessary to post a status every day. Actually, it can grow quite tiresome for some people to see content from an organization clogging their newsfeed, even if it’s from a non-profit or association they care about. Save your best content for Facebook so people aren’t skipping by your posts that are only there because you thought you should post every day. Make it fun, engaging and worthwhile. Of course, if something is happening, say a big event or a breaking news story that affects your community, it’s okay to post something two days in a row. It’s all about measuring the content’s relevancy and timeliness to your audience. Too much of a good thing can become a bad thing! This is actually a bit of a trick question, or rather a trick answer. You shouldn’t be deciding if it’s one or the other, you should be creating both. A company (or ‘Organization’) page is great and has many benefits. Your organization can share news, company information and helpful pieces of content, like blog posts, through company pages. Groups, on the other hand, can be thought of as a place for individuals to have conversations. While your organization can’t run groups, you can as a representative of your non-profit or association. Groups are a great way to get discussion going and be more inclusive. They often have a broader focus, such as issues affecting a certain industry or issue, and encourage those who may not be connected to your organization yet to participate. From there, the participants are only a few steps away from engaging with your organization. Using social media these days is the equivalent of being in the phone book back in the 1980s; if you’re not investing in a spot, than you’re not going to get noticed. It’s no longer a matter of if you should be on social media, but how. Many people, mostly skeptics, will point to hard-to-come-by statistics on the financial return on investment for social media, but the benefits of social media don’t always come with a dollar amount attached to them. Rather, social media should be looked at a means to engage and communicate with your community, providing them with service and value in order to encourage them to invest time, money or interest in your non-profit. You’ll likely never get a phone call from someone saying they joined your association or donated to your cause because of a tweet they saw or pin they liked, but exposure to consistently great content, over time, will cast your organization as an expert that prides itself on communication, transparency and hard work to achieve a goal for members. This should be the real gauge of how well your social media efforts are doing. Online and offline efforts are not in competition with each other. It is not social media’s intent to destroy face-to-face interaction and it’s not the tradition meeting’s aim to shout down Twitter, Facebook and the like. They actually complement each other quite well. For example, if you develop a strong Twitter following, try organizing a tweetup at your next conference or fundraising drive. A tweetup takes the best of the old school and the new school and combines them into a great networking and learning opportunity. We’ve mentioned before in this blog that the social networking platform Meetup is a great way to promote face-to-face small group continuing education online. It lets people connect who may not have ever connected before and plan a localized event that they find immense value in. Tying you organization to one of these events will only endear you further to your members or community. The days are getting shorter and back-to-school commercials are starting to pop up on. That can only mean one thing; the Canadian National Exhibition is in town. The CNE is the annual end-of-summer fair that takes place in Toronto and includes midway rides, carnival games and countless other attractions. And one more thing; food, lots and lots of crazy food. ‘The Ex’, as it has lovingly been called, has become quite infamous as a testing ground for weirder and weirder food combinations, year after year, like deep-fried butter and cronut burgers (a hamburger with donuts taking the place of the buns). This year is no different. Some of the new items available at the CNE in 2014 include spicy peanut butter sriracha rolls and butter coffee. You’re probably more than a little hungry by now, but you might also be wondering what this has to do with social media and non-profits/associations. Here are four things that organizations can learn from the wacky, greasy, shamefully-delicious food selection at the CNE. Part of the reason any sane person would ever eat a cronut burger or deep-fried butter is being able to brag to their friends about it. That’s the reaction you want from your members/community. When you make your social media efforts part of a unique experience for anyone involved in your organization, they will keep coming back and they’ll bring friends who can’t resist being a part of something extraordinary. Devising and implementing an experience like no other is not an easy task, but the best way to get the creative juices flowing is to answer a few key questions, including; What does your community need? What solution can you develop to include as many members/people as we can? How can you make it easy for these people to share this experience with others? Something as simple as a great Twitter chat, a Pinterest board mural or an Instagram scavenger hunt can go a long way to getting people involved in your organization because you have provided something they rarely get anywhere else. There aren’t just crazy, over-the-top food options at the CNE; there’s lots of choice when it comes to picking something for lunch or dinner. The options range from Canadian comfort food (poutine and back bacon sandwiches) to Japanese (sushi) and everything in-between (pasta, perogies, curry, etc). The point is, there is something for everyone and it’s never boring. The same concept should be applied to your non-profit/association’s social media strategy. It’s great to publish a comical story about your industry, such as a hilarious YouTube video, but it’s not especially wise to make this a daily occurrence as it doesn’t really help members or progress your organization’s goals. It’s necessary to tweet about new services your offering, success stories from your non-profit fundraisers, editorials on current events, findings of the latest surveys or reports, peer-reviewed articles and many other forms of content. This goes for all platforms. Mixing it up every so often will allow you to provide frequent value for member, donors, volunteers, staff, sponsors and other involved in your organization. 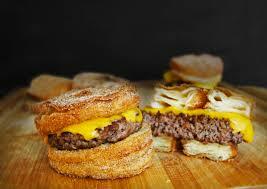 There’s been a lot of talk about the cronut burger in this post and for good reason. It was one the most talked about foods at the CNE over the last few years, for both good and bad reasons. In the early days of last year’s fair, the cronut burger was the biggest food adventure, but only a couple days later people began to get sick from the glazed delicacy. It turns out the cronut burger stall in the Food Building didn’t exactly pass health inspection with flying colours. Your organization’s social media can learn a thing or two from the cronut burger fiasco. First of all, have a plan. Poor organization and lax guidelines make for nightmares down the road. If you have a plan and stick to it most of the time (barring any breaking news and appropriately light-hearted spontaneity) than your social platforms will run like a well-oiled machine. Creating a content calendar is good place to start and can be a big help with running your platforms effectively and efficiently. You should also give your social media a health inspection of its own. Review the performance of your organization’s social media performance regularly and update your strategy. Don’t only look at the numbers, such as clicks, comments, retweets, follows, likes, etc. Ask your staff, members, donors and the rest of your community what they like and don’t like about the current strategy and update your plan accordingly. 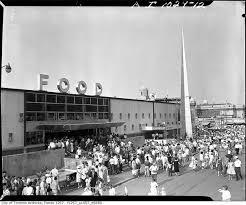 The CNE has been around for more than 100 years and food has always been a major feature of the event. Generations of Torontonians remember their first ice cream waffle sandwich or their years of sampling Tiny Tom donuts at The Ex. Your organization’s social media strategy needs the same kind of consistency as the food at the CNE. It is crucial that posts are regular. For example, if you create a blog for your non-profit or association, make sure to evaluate your resources (monetary, time, etc) before you start publishing. This will help you determine how often you can realistically post a blog with consistency. Otherwise you may publish three blog posts in three weeks, hit a busy period at work and not post for two months. Your community will become disillusioned and will be less likely to be loyal followers of your blog and other platforms. Your organization’s social media platforms need to be consistent, organized, unique and varied to appeal to your community, much like the food at the CNE. So next time you’re stuck in a rut online or are looking to venture forth on a new platform, remember these four tips and you won’t go hungry. Yesterday, August 11, was the first ever Social Media for Non-profits, Toronto Meetup group, sponsored by Incline Marketing and there was no shortage of great tips from the speaker and engaging discussion among the attendees. If you are unfamiliar with Meetups and what they are all about, you shouldn’t be for much longer. They are one of the next steps in continuing education and are a great way to learn and network. Last night’s event looked at blogging and how non-profits, associations, charities and small businesses can utilize the platform to grow and thrive. The speaker, online marketing specialist Kelsey Atkinson, gave a great talk that covered everything from the benefits of blogging to the nitty gritty task of actually writing a post. There are numerous reasons why you should have a blog (community building and content creation for example), but one reason you may not have thought of is improved search engine optimization. In extremely simplified terms, SEO is what determines what page your website shows up on when a current or potential member of your community searches for relevant words or phrases on search engines, like Google. Atkinson says that Google is always looking for new content on your organization’s website to determine its relevancy. You are not going to be updating your mission statement, list of services or contact information every week or month, so a blog is the best way to get fresh content on your website that will make it easier for people to find your site and get some value once they are there. One of Atkinson’s points was to tailor your blog design to the wants and needs of your audience. This may seem like a no-brainer, but there are many little details that are nonetheless important and often get left by the wayside when you are planning and publishing your blog. For example, if your members or readers are predominantly seniors, make your blog’s font larger so it is easier to read. If the majority of readers are people from your industry, feel free to use jargon and pro-speak because your audience might feel insulted if they think it’s been dumbed down. However, if you’re writing for the general public, simplify things a little so readers don’t feel alienated, confused and left out. Social media is a great way to come up with ideas for blog posts and hidden among the tweets and links to other blogs is another great source for content; questions to your community. Atkinson says that asking questions on Facebook, Twitter, LinkedIn and other social media platforms can generate great responses and even better blog topics for your site. When you get to the heart of what members/donors/volunteers/customers are thinking and doing on a regular basis, you can determine what issues are most engaging and relevant to your community. Answers to your questions can open your mind up to fresh perspectives and views that you never would have thought of otherwise. Writing a blog week after week, month after month can be monotonous at times, so imagine how your readers might feel. Posting the same old blog post, in the same old format can get tiresome for your community and can end up driving them away. Luckily, Atkinson had a few pointers on how to change things up from time to time and inject some excitement into your organization’s posts. She outlined five different types of blogs in her presentation, which included lists (good for a quick read, categorizes information to make it engaging and easy to take in), interviews with staff/members/etc (get a fresh voice on your blog, it’s conversational, highlight’s passion), visual (photo collages or infographics that present your organization and stats in an engaging way), guest posts (a fresh voice, lends legitimacy to your blog) and the traditional take (informative, in-depth, storytelling). Before you hit publish on your newest post, you should probably take one extra step, says Atkinson. It’s always a good idea to get someone else from your organization or industry to give your post a once-over before it goes live. This not only cuts down on the amount of inevitable spelling and grammar errors, but it also serves as a check and balance for your style, format, voice and information. The proof-reader may alert you to the fact that you are using too much jargon or that you need to include links within your text to guide people to other parts of your website with more information. Sometimes an extra set of eyes is just what your blog post needs to cover all the bases and take that one extra step from good to great. Having a blog on your organization’s website is no good if no one reads it. That is why promotion is so crucial to realizing the benefits of blogging. There are the social media channels of course. Tweeting, posting on Facebook and LinkedIn and pinning your blog on Pinterest are all great ways to get the word out. But there are many other paths that are already well-established within your organization that will help people find your blog, says Atkinson. Tack the web address for your blog onto your email signature and business card for when you are getting in contact with members or connecting with a colleague at a conference. Add a link to the organization’s blog to the weekly or monthly e-newsletter. Tell people about your blog before you start a presentation or when you create your organization’s regular magazine. Your organization has worked hard to establish a connection with its community. Use these connections to draw attention, and traffic, to you blog! Creating, maintaining and growing a blog for your non-profit, association, charity or small business takes a lot of work and dedication. The six points above can go a long way to helping you sustain your passion for the project moving forward and will ultimately lead to growing your organization. Thank you to everyone who came out to the first ever Social Media for Non-profits, Toronto Meetup. Stay tuned to lots more opportunities to meet up and learn about social media in the near future!